In talking about episode twelve of Doctor Who last week, I expressed the hope that we wouldn’t get a total cop out of a resolution to the Doctor regenerating cliff-hanger – so what did we get? A total cop out of a solution where the Doctor directs his regeneration energy into his hand in the jar. If the Doctor is able to partially heal and then stop the regeneration by redirecting remaining regeneration energy somewhere else, why hasn’t he done it before? It’s not as it it hasn’t been established that the Doctor has special healing capabilities before – the climax of Frontier in Space leading in to the beginning of Planet of the Daleks for example – however it wouldn’t have had quite such a big climax to lead into Journey’s End if they had done that. The regeneration energy is also needed as a vehicle for the creation of another Doctor from the hand in the jar, and to give Donna the abilities to save the universe, but also the reason why she must leave the Doctor. Sadly, much as with last year, the cop outs extended to the way that the threat of the Daleks is dealt with. As the Doctor and his companions are trapped by Davros and the Daleks it becomes clear that Davros is very much not in charge – however this idea once started is just abandoned as the whole plan to destroy reality is defeated by a technobabble based solution revolving around a convenient machine in the Dalek base that allows Donna, now embrued with all of the Doctor’s knowledge having touched the hand in the jar, to remotely disable all of the Daleks, and for the half-human clone of the Doctor to destroy them all. The previously unknown powers that might have been useful previously pop up again after this with the TARDIS hauling the planet Earth back home (although don’t thing too much about the effect of the Earth vanishing and then being hauled back into place might have on the rest of the solar system) and then in the final scenes the Doctor seems to be able to telepathically erase bits of Donna’s memory, again something that has not been seen before. This scene is equally frustrating because it is just rushed through – indeed it could be argued that Donna was mentally violated by the Doctor in that she is not given any choice about what happens – whether to die as a result of the effect of the merger with the Doctor’s mind, or to have those memories and all her memories of the Doctor removed, but to live. Certainly I think there would have been more pathos to the whole thing if Donna herself had to choose. However, like much of the ending, it was rushed, as there were quite a lot of farewells to get in. First off, Sarah Jane heads off, then Jack heads back to Torchwood apparently taking Martha and Mickey with him. Rose and her mother are deposited back into their parallel world, along with the clone of the Doctor – when you think about it, a bit of a lousy consolation prize for the girl who has declared undying love for the Doctor, being left with his potentially unstable clone. All of this then leaves the Doctor heading off alone once again, as he has done at the end of each season aside from the first. I think what bugs me most about this, is that much as with last year, and probably more than episode twelve, this is a reminder that Russell T Davies was a childhood fan of the show, and through his series finale episodes in particular he produces the kind of massive spectacular stories that most childhood fans produce. But having to produce a vaguely coherent story he then has to resolve all of these spectacular ideas, which is where the whole thing falls down. When you look back at episodes such as Midnight it is apparent that he can produce a good story, however all to often he goes for the big spectacle ideas that end up coming over as being not much more than fan fiction with a budget. When looking back at the last four years it is interesting to note that the well respected writers such as Steven Moffat and Paul Cornell are the ones that are producing stories that push the format with new ideas, and who generally avoid dealing with established characters or monsters. Whether Steven Moffat will continue to eschew established monsters, and especially avoid the kind of end of season spectaculars we have come to expect remains to be seen. If he doesn’t, we can only hope that Steven Moffat will realise that at the heart of the story we still need a coherent plot. So were there any redeeming features? Once again, Julian Bleach delivered a fantastic performance as Davros, and certainly I hope he gets the opportunity to reprise the role, perhaps with a bit better plot to work with. Bernard Cribbins again gave a good performance in the closing scenes as the Doctor returns his granddaughter. Certainly you can’t help wishing that perhaps the character would have got at least one journey in the TARDIS during his time on the show. There were a few laughs during the programme too, with a running joke between Donna and Jack, and the return of characters such as Jackie and Mickey giving the opportunity for some reminders of previous relationships. All in all, with the departures of Phil Collinson, Russell T Davies and Julie Gardner, this was very much a swan song episode for the three of them, tying up a load of loose ends and finishing up the stories for characters created during their era in charge of the show. Much as in the past, when the next full series returns in 2010, I’m expecting that it will feel rather different, as Steven Moffat makes his mark. Whilst there may be elements that will be carried over, certainly other things will be rather different – getting rid of fanfic style finales for a start we hope. So what exactly is going on? It was announced ages ago that David Tennant was signed on for the specials next year, indeed he has apparently been seen filming the show for Christmas already. Only last week there were reports that the BBC was offering him Â£1.3 million to stay in the role. About the only high profile â€œDavid is leavingâ€? came from Catherine Tate back before Christmas. So has the BBC finally succeeded in keeping something secret from fandom? We’ll have to wait until next week to find out – certainly the trailer is giving nothing away, and the press office release is still only listing Tennant in the part. Anyway, what about the rest of the episode? I’d mentioned last week my fear that it would be a return to a traditional Russell T Davies episode in that all the numerous guest stars would crowd out elements such as the plot. Certainly from the blink-and-you-miss-it nature of the opening titles, plus a further list of names captioned over the opening scenes, it was clear that there were a lot of big names to fit in. But to some extent, looking back at the episode as a whole although there were a lot of strands there wasn’t really that much of a coherent plot, indeed although we establish that it is the Daleks who have Stolen Earth, by the end of the episode we really have no idea of why the planet has been taken, it having taken most of the running time of the episode for the Doctor to even find where the planet has been taken. To do this he first heads off to visit the Shadow Proclamation. After being mentioned throughout the series over a number of years, their appearance was frankly rather a disappointment, after a great looking external shot the actual location looked like an office foyer. From an action point of view the Doctor and Donna effectively explain the back story that has been building up, so we get a list of missing planets which alongside several from the new series includes Calufrax Minor, the name being familiar to people who remember the Douglas Adams story The Pirate Planet. Ultimately it is the missing bees, which have been mentioned in throwaway lines that leads the Doctor to a way to locate the missing planets, and takes the TARDIS to the Medusa Cascade, referred to in Last of the Time Lords as the location of a time rift sealed by the Doctor during the Time War. However when the TARDIS arrives, there is no sign of the missing planets and the trail goes cold, leaving a despondent Doctor. Once the signal is boosted enough to break through to the TARDIS and Harriet Jones is discovered by the Daleks and apparently exterminated – although note that we don’t see her die. Torchwood again are discovered by the same means, and Sarah Jane ends up face to face with two Daleks too. However it seems that the Daleks are well aware of the Doctor’s allies. Davros it is revealed has been saved from his death during the Time War by Dalek Caan who having escaped at the end of Evolution of the Daleks has broken the time lock around the Time War to save his creator, albeit at the cost of his sanity. Davros however has kept him alive as he now seems to be able to predict the future – making vague predictions about the arrival of the Doctor, the death of his most loyal companion, and the arrival of the Dark Lord. The one factor that doesn’t seem to have figured in the plans – and indeed is someone never seen by the Daleks is Rose, who despite the Earth being shifted is still quite able to transfer in and out of the stolen Earth at will. She and the Doctor finally meet again at the climax of the episode, shortly before the Doctor is floored by a glancing hit from a Dalek gun, and the apparent regeneration process begins. So what is going on? There are lots of strands to connect, and quite a few throw-away lines that I’m sure will come back to be significant – in particular the mysterious Osterhagen Key that Martha is given as she escapes New York, but later told never to use by Harriet Jones. The fact that Dalek Caan has broken the time lock around the Time War may yet prove to be significant, along with the stolen worlds being hidden outside the normal flow of time. I’m sure that there will be some more significance to some of the things that Dalek Caan has said too. In all it was an enjoyable episode, but with some classic Russell T Davies techno-babble to hurry the plot along. I’m more inclined to credit the crisp direction from the highly experienced Graeme Harper that rose above the script for the final result. It wasn’t only the good director that made it enjoyable, there were also some fabulous performances from the extensive guest cast – Julian Bleach being a particularly creepy Davros, and some great moments from Bernard Cribbins reliving his earlier encounter with the Daleks with some well aimed paint gun pellets. The crossover elements relied somewhat on knowing the other programmes, and certainly there were lines in those scenes that would be totally lost on people who hadn’t watched them, however nothing that really required that you had watched. As you can no doubt gather from my comments further back, the ending was a real surprise, and certainly if David Tennant isn’t leaving I hope we don’t get a total cop-out of a resolution. Doctor-light episodes seem to have become a way for the Doctor Who production team to do something a bit more experimental. This has happened right back from the early days when a lead actor needed to take a break the Doctor or his companions would find one or other of them turned invisible as in The Celesital Toymaker, transformed temporarily into a different actor as occurred in The Mind Robber or imprisoned as happened in The Time Meddler. In the new series we’ve had a couple of Doctor light episodes where the main cast gets involved in the story but the core characters are separate. This year we had a pair of stories, with Donna taking a break last week, however it is rather more difficult to sideline the Doctor in the same way. In Turn Left the chosen route was a classic alternative history story, exploring what would have happened if Donna had not taken the job where she initially gets involved with the Doctor. As a result, she is not present to snap the Doctor out of his almost trance like state during the climax of The Runaway Bride, and in the alternative version of events the Doctor dies during the encounter. Throughout the rest of the episode we see key events in the series through the eyes of Donna as an ordinary person. So the events of Smith and Jones are seen, but Martha Jones dies, and it is Sarah Jane Smith who gets involved, and again she doesn’t make it out alive. The next big event series wise is the return of The Master, but of course since he is released by the Doctor after the events of The Runaway Bride, in this alternate reality he is still trapped in the far future. Next up without the Doctor, the replica of the Titanic does smash into London, wiping out millions and plunging the UK into chaos. Thanks to a bit of intervention from Rose Tyler, Donna is safely away in the country. Moving on to the latest stories, the Adipose don’t much affect the crippled UK, and with petrol rationed, the Sontaran Stratagem has much less of an effect, but it is Captain Jack and Torchwood who help defeat that threat, but again at the cost of their lives – the immortal Captain Jack is left stranded on Sontar. All of this goes towards removing all the possibilities for salvation when towards the climax of the episode stars in the night sky start to disappear as part of what Rose refers to as the approaching darkness. Using the last remaining power from the TARDIS, which UNIT had salvaged, but which following the passing of it’s owner is slowly dying, Rose sends Donna back in time to stop her past self from making the fateful decision that leads her away from the Doctor, turning right rather than turning left. Ultimately Donna sacrifices herself in the alternate timeline, and as she lays dying, Rose appears once again and whispers two words to tell the Doctor. Much as with Utopia last year, episode eleven was very much about putting things in place for the series finale. With that episode as with this, it is the last few minutes of the episode that are key. This time around the big reveal moment is when Donna repeats the whispered words which both confirms the identity of Rose, and also highlights the importance of what is happening – Bad Wolf – the words that Rose scattered through time to guide herself and the Doctor towards their fateful battle against the resurgent Daleks. In much the same way, from the glimpses in the trailer, it seems the last Dalek who escaped at the conclusion of Evolution of the Daleks may have started anew – perhaps with a little help – and once again Bad Wolf is guiding the Doctor and his companions towards another battle, and again from the clues laid down in this weeks episode, the cost is going to be high. What made the episode, was the big conclusion, and the expectation it produced for the finale. Despite some strong performances, I thought the rest was pretty derivative. The â€œWhat Ifâ€? idea has been done in a lot of other series, and whilst it was interesting to see the alternative history, it was in some ways pretty predictable, and a lot of the episode was very much a whole series of continuity references for fans – and yet another temporal paradox. The almost messianic idea that Russell has used previously was clear as well, everything is bad without the Doctor. What might have been more experimental would be if some things had actually been better had the Doctor not been involved. The giant beetle monster and the whole concept of what it did really didn’t hang together overly well either – and the question of how a dying Donna in the alternate timeline that ceases to exist was able to give a message to the Doctor is something that really doesn’t make sense either. As the SFX preview of the finale has said cramming an episode with continuity references entertains the fans, but sometimes when you look at it rationally, peeling back the references, there isn’t much underneath – sadly my opinion this week was that it was primarily a vehicle for the fan pleasing references, and didn’t do much underneath. Hopefully things might be better next week. Turning to next week, it looks like we’re going to get multiple trailers, the first of which is online already. After the general despondency induced by a whole load of depressing Eurovision voting, there was the main event of the evening (to some people), the Doctor Who mid-season preview, the now traditional special trailer we get to make up for the fact that the programme has been bumped for a week. First off, no secret of the fact that Rose is definitely coming back, although this is definitely more of a tough gun wielding Rose than before, and the Doctor seems happy she’s there. 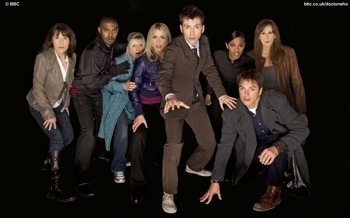 In terms of other rumoured returning companions there is no sight of Captain Jack or Sarah-Jane Smith. In terms of plot give-aways, we’re certainly going to have to contend with a generation of kids with an irrational fear of the dark after next week I’m sure – but darkness also seems to figure elsewhere, with stars apparently disappearing in the night sky. Rose refers to a darkness coming from across the stars at one point too. We also get a lot of quick fire clips of explosions, what looks like a fire in the TARDIS, and also the Doctor apparently swimming through the time vortex. It is also pretty clear from the trailer that the Daleks are back in force, so my guess would be that they are turning up in the finale. You also get a pretty good hint that Davros is going to return, as the trailer includes something that looks very much like an updated version of the character moving out of shadow, but which of course cuts before you get a clear sight. After weeks of only having shaky in-cinema recordings of the preview trailer, the BBC have posted a copy of the Doctor Who Season 4 trailer to YouTube – less than two weeks to go now, April 5th is the date for the diary. There is a brief glimpse of the Sontarans fighting UNIT soldiers, giant wasps for all the insect-phobic, a nice shot of what looks like an ice planet, lots of running, explosions, a very wet looking Martha, and Rose appearing right at the end. The Daleks don’t appear in the main trailer, but instead they get their own teaser trailer, alongside similar trailers for the Sontarans and the Ood – the three big recurring monsters for the season.